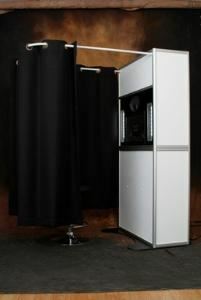 Professionally manufactured, state of the art portable photo booths available for wedding receptions, corporate events, birthday parties, holiday gatherings, bar and bat mitzvas, anniversary parties, etc. Unlike other photo booth rental companies we don’t charge for set up or tear down, or for travel to events within 100 miles! All events include unlimited use of the photo booth, our extensive collection of props, customizable text for your photo strips, password-protected copies of all of the pictures taken, and two of our friendly and professional staff members who are there to make sure that your event is picture perfect! *Please note that there is a two hour minimum event time. There is a small travel fee for events 100+ miles from our location. Be sure to ask about our discounts for schools and military patrons!